The Rothschild family is rich, but claims that they have a net worth of $500 trillion and own 80% of the world's wealth are grossly exaggerated. 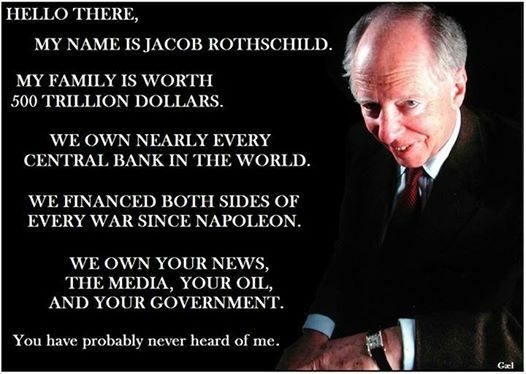 The Rothschild Family owns 80% of the world's wealth, with a net worth of $500 trillion. While the Rothschilds are indeed very wealthy, claims about their net worth such as the ones displayed above are grossly exaggerated. Conspiracy theories concerning the Rothschild family date back to the 18th century, and the family’s wealth was largely responsible for the anti-semitic belief that “Jews control the world’s money supply.” The Rothschilds are frequently associated with theories about the Illuminati, the New World Order, and other dark money groups that supposedly pull the strings of world governments, and the Rothschilds have been blamed for everything from starting wars for personal gain to funding the Holocaust to assassinating U.S. presidents. The greatest of these financial adepts was Mayer Amschel Rothschild, born in 1744 in a Jewish slum of Frankfurt. Not much is known about his early life, as his was one of tens of thousands of marginalized, outcast families. But once he came of age he became an apprentice at a small bank in Hamburg, where he learned the trade. Returning to Frankfurt at the age of 19, he offered his own banking services in a modest way, beginning with trading of rare coins and related investments. He was energetic, clever, and most of all he was charismatic. And he was smart, seeking out wealthy clientele, and associating with nobility whenever he could. By the age of 40, he had consolidated his most important business contact: the Landgrave William, the Elector of Hesse, one of only a tiny number of nobles empowered to elect the Holy Roman Emperor. When William was younger, he had engaged in the trading of rare coins with Mayer’s father, and so the two had always known one another. When William inherited his own father’s massive fortune, his friendship with Mayer Rothschild gave Mayer the ability to begin conducting larger international transactions. Although the Rothschild family has amassed great wealth since the 1700s, claims that they have a net worth of $500 trillion or that they own 80% of the world’s wealth are problematic. 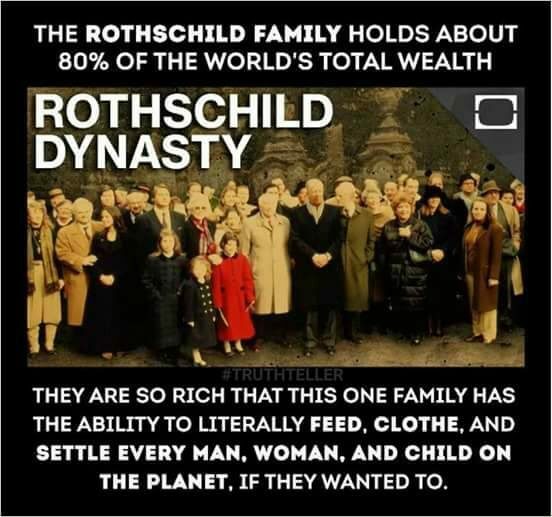 Also, the Rothschilds began acquiring their wealth in the 1700s, and since then the family has spawned hundreds of descendants, so there is no longer any centralized Rothschild family wealth. The closest thing to a “Rothschild Family” business in 2016 is the Rothschild Group, a multinational investment banking company, but that firm does not in itself generate nearly enough income to back up claims about the family’s wealth. In 2015, the Rothschild Group’s annual revenue was approximately $500 million. In comparison, the world’s largest company, Walmart, has an annual revenue of nearly $500 billion. While the Rothschild family certainly was one of the world’s most significant financial powers in centuries past, they no longer wield the same sort of influence over global affairs. 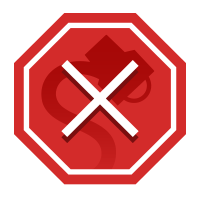 Skeptoid Media. 22 May 2012.
Credit Suisse. 13 October 2013.